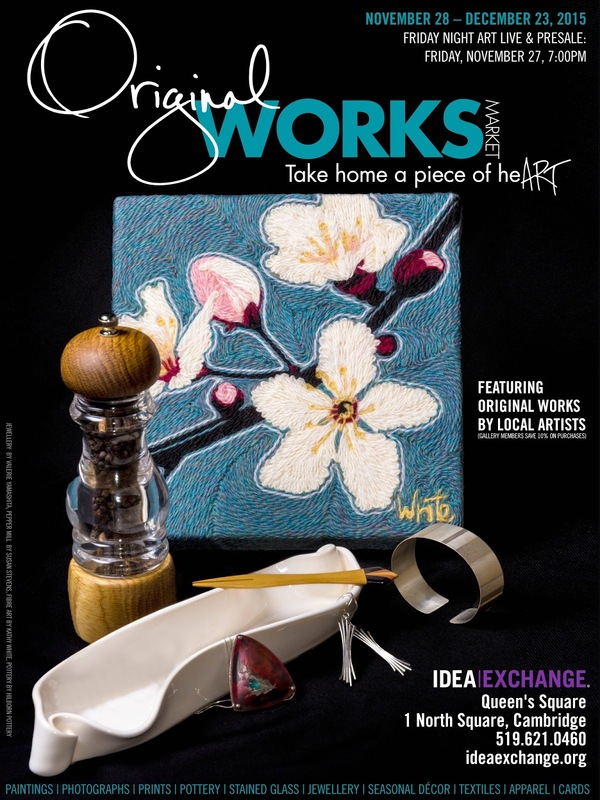 Kathy White: I am a poster child for OriginalWorks 2015! I am a poster child for OriginalWorks 2015! Wow. How great does this feel? That's my work, right in the centre! I was thrilled when the Idea Exchange in Cambridge, ON not only accepted my work for their OriginalWorks Market, but also asked if they could use 'Vibrant Blossoms' on the poster. I couldn't say 'Yes, please!' fast enough. The OriginalWorks Market features the work of local artists and artisans, hand picked by the gallery. Everything is priced under $300 and there are lots of choices for holiday gift giving. Open daily from November 28th to December 23rd, the gallery is staffed by volunteers, including the artists. I will be there helping out on Sunday, December 6th from 1:30 pm to 4:30 pm and on Monday, December 21st from 3 pm to 5:30 pm. Come on by and do some Christmas shopping. I'd love to see you! The Idea Exchange is doing some really amazing things. I am especially fond of their Fibre Art Collection - go figure. They are a current and vital part of both their immediate community and the larger art scene, which is no easy task in a digital world. I am looking forward to meeting everyone at the Idea Exchange and getting some of my own Christmas shopping done while I'm at it. Hopefully, I'll see you there.